It’s hard to believe that it was already a week ago that we loaded into the Toyota Sienna and barreled down to Virginia with another school year behind us, and an adventure before us. I usually like to give the kids a couple of days to acclimate to summer vacation before taking off, but we had a destination and a deadline and after one full day out of school we were off to begin leg one of what would amount to about 1,300 miles in the car— and way more hours than any of us would probably like to count. We left last Friday morning at the not so early hour of 10:15, almost two hours later than I had “planned” to get on the road. The minivan was packed to the gills with pillows, stuffed animals, my arsenal of books and notebooks, coolers, a tent, sleeping bags, camping chairs, bug spray, snacks, coloring books, I-pads, granola bars and small plastic toys. “Lis, are you serious?” Scott asked. “We need ALL of this stuff? This is ridiculous!” he bellowed, while trying to strategically stuff the minivan like a game of Tetris. We thought the first leg of our trip from Buffalo to Radiant, VA would take 6 1/2 hours…we’re still trying to figure out how we miscalculated that one, but alas, we wound up in the car for close to 10 hours (8 1/2 hours of driving + 1 1/2 hours worth of stops). About halfway there I had a fleeting moment, when Ella looked like she was about to throw up, that I wondered if it would be easier to turn around and head back home. But, we persevered and while we intended to show up at the writing retreat between 2 p.m.- 5 p.m. (the scheduled check-in time before dinner), we wound up crackling down the stone dirt driveway that led up to the farmhouse and barn at 8:15 p.m., smack dab in the middle of a quiet open mic session. “Girls, please be quiet when we get out of the car. This is a writing retreat and we needed to be respectful,” I said in a whispered tone because our minivan windows were open. “But I need to go to the bathroom! !” Aubrey bellowed. I found myself within moments of pulling in, asking a woman I had only met online (the farm owner and retreat coordinator) if there was somewhere I could take Aubrey to pee without interrupting the event in the barn. "Of course," she warmly said, "You can take her right into our house." And, that’s about how life goes when you integrate family life and your personal passions— it’s a great big mix of making plans, being flexible when they start to fall apart, and finding a place for your toddler to pee in the midst of a quiet literary event. The important part was that we made it just in time to roast a marshmallow, set up our tent before dark, and kick off conversation with some incredibly kind folks. 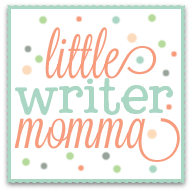 All in all the Writer's Retreat on God's Whisper Farm, hosted by Andi Cumbo-Floyd, Kelly Chripczuk, and Shawn Smucker, turned out to be a sweet and encouraging event. I had toyed with the idea of attending several larger writing conferences this year, but felt God nudging me towards something less stressful, more peaceful, and all together just as significant in my growth as a writer. “Show me where you want me to go this year God…in all things, but particularly this writing journey,” became my prayer. In the midst of praying that prayer for several weeks, God had also been teaching me about how he speaks to us in quiet places, in still small voices, in ways that we will miss if our lives are too full, boisterous, and noisy. Listen to the whispers, He had been saying. 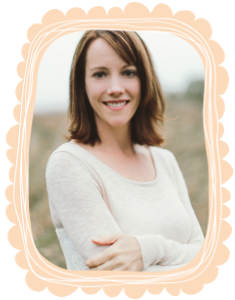 And so one night, when I randomly stumbled upon Andi Cumbo Lloyd's website and saw that her farm was called “God’s Whisper Farm” and that she was hosting her 4th annual retreat, there was no question that I needed to be there. The only hang-up; the retreat was being held June 23-25, right after the girls got out of school and right over Scott’s birthday. I knew I couldn’t ditch everyone at the beginning of summer vacation and didn’t want to leave Scott alone on his birthday. Scott loves to pitch a tent and we had yet to attempt sleeping in one as a family--I wasn’t so sure up until this moment that it was something that sounded like a whole lot of fun with 3 children--but since my attending the retreat seemed to be hanging on the line, I was willing to see if this crazy idea could work. Andi agreed to having the whole family come and to let our big, boisterous crew camp right on the 15-acre property. It turned out to be a fantastic idea after all. It would take me many paragraphs to tell you about all of the ways that God spoke to me throughout the weekend, but the summary is that we all had a ton of fun, the girls asked if they could come back next year, and Aubrey now consider’s Andi’s husband Phillip to be one of her very best friends in the whole wide world (such a cute story!). The girls have already asked if we can go back next year, we got to see a part of the country neither Scott or I have ever seen before, the weather was gorgeous, the entire family made new friends with a whole bunch of wonderful people and my spirit was filled with many things I wasn’t expecting, but realized I needed. 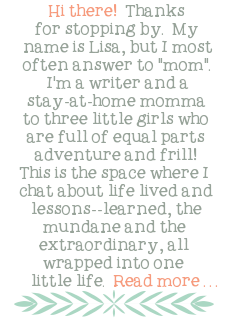 Over the last ten years, in my life as a mother, I’ve pulled, wrestled, cajoled, cried, kicked, tried, embraced, moved towards, moved away from, and done circles around this idea of cultivating a writing life in the midst of stay at home motherhood. I’ve emotionally embraced the chaos of it all and set my heels in at times. I’ve thrown my hands up in the air at others. At times I have been tired of trying to make time for them both, when they often felt like such separate entities. In the last few months I have felt my spirit and my body growing weary…just plain old tired from the daily demands and trying to make everything, and everyone’s schedules “work”. I sensed that my spirit needed to be renewed in some way, but I wasn’t sure how to do that. This past week, even though many moments have been hectic and harried, my spirit has quieted down a bit. After we left the retreat last Sunday, we drove to Shenandoah National Park, and stood in awe for three days of the majestic views that surrounded us. The pace is slower in the mountains. You do things like just look at trees and stop to watch sunsets even when your logic tells you it’s time to get the kids to bed. While I had read those words countless times, it felt far more personal to be reading them right next to literal green pastures, besides still waters, and in the midst of soul restoration. I’m no dummy— I know what I’m heading back into when we get home in a few days (we’re in Ohio now). The house is a dusty, littered mess from packing up for a 10 day trip at the end of a busy school year. I will have 3 children home, bored, asking me what to do and I will need to don my referee hat and whistle to interject reason into the fights that are sure to break out. I'm sure to feel tired and weary at some point, maybe many times in the next few months. But, David, the psalmist, wasn’t going to be sitting by still waters forever either. He had nations to lead, and battles to fight and land to defend. But, he reminds us that our restoration doesn’t happen in spite of those things, it often happens in a few quiet moments right in the midst of them. Here's to hoping you find a quiet place and space for soul restoration sometime this summer.